To begin the game place all seven starting spaces (purple background and yellow foreground) in a row with all of the numbers pointing upward. The rest of the tiles are dealt out in six rows of seven cards. Before being placed all of the cards are placed so the “0” side is face down. For two player games the rules recommend making a 5X5 square instead of a 7X7 square. 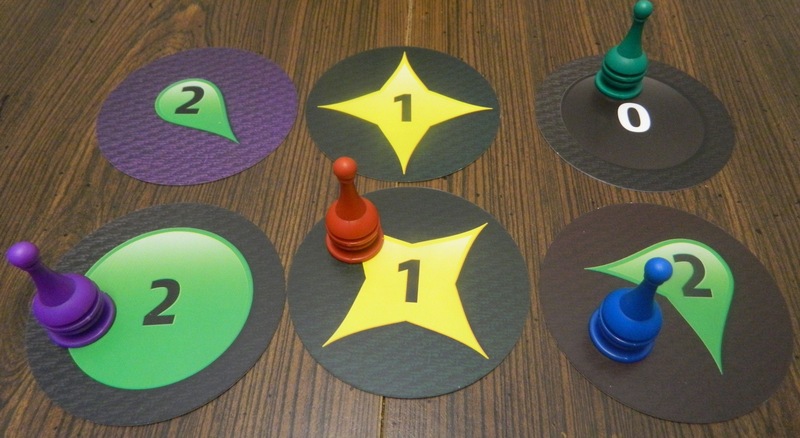 Each player chooses a colored pawn and picks a starting space to place it on. Each player is dealt four cards. A players turn goes as follows. Draw Cards: The player draws as many cards as the number that is on the space that they currently occupy. Play Cards: The player has to play half of the cards in their hand. If a player has an odd number of cards they must round up. 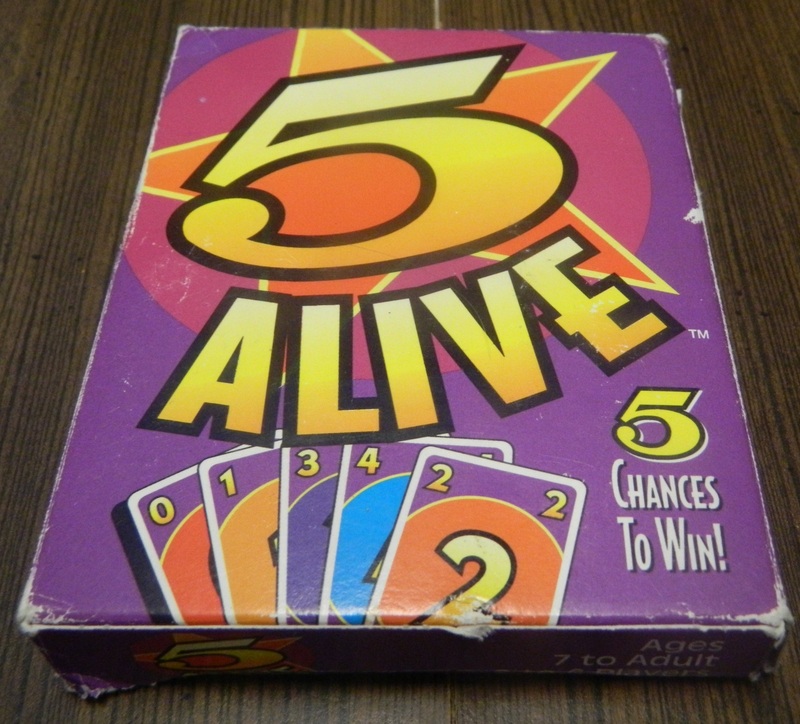 For example if a player has five cards, they must play three cards. If after playing cards a player runs out of cards, they are eliminated from the game. Move Your Piece: The player must move their piece one space in any of the directions shown on the card their piece is currently on. You cannot move off the gameboard. If you are unable to move during your movement phase, you are eliminated from the game. If after your move phase you land on a space occupied by another player, you must give them as many cards as the number printed on the card that you landed on. In their current positions the purple and blue players would draw two cards at the beginning of their turn, the red play would draw one, and the green player would draw zero. As far as movement is concerned the purple and green players will need to play a card that will move them off their current space since they currently can’t move on their move phase which would eliminate them from the game. Meanwhile the blue player can either move down or left. The red player can move on any of the diagonals. 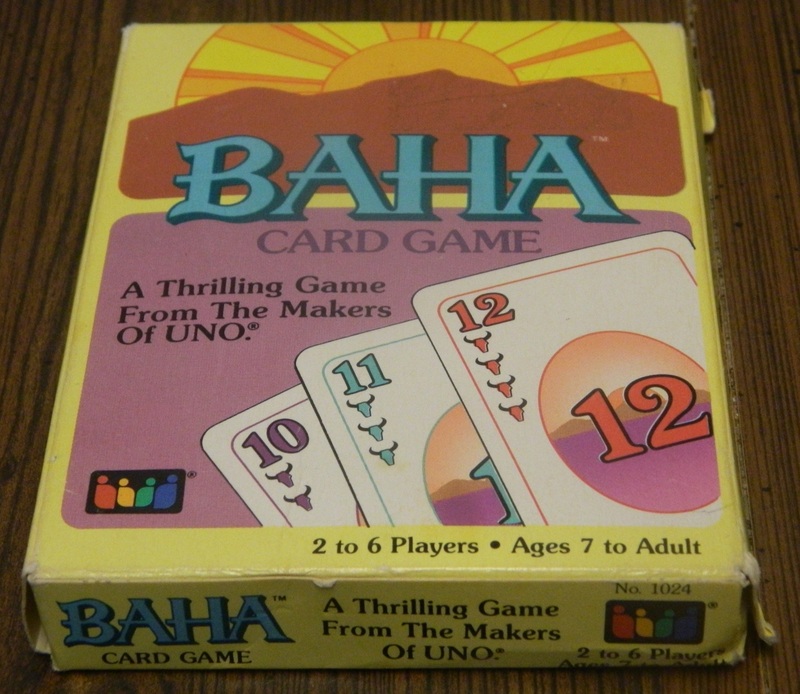 The game continues until all but one player is eliminated from the game. Players can be eliminated in the following ways. If a player ever runs out of cards during their turn (after the draw phase). If a player is unable to move their piece during the move phase. When eliminated the player removes their piece from the gameboard but keeps the cards that they have in their hand since they could be brought back into the game if another player plays a card that re-invites players into the game. 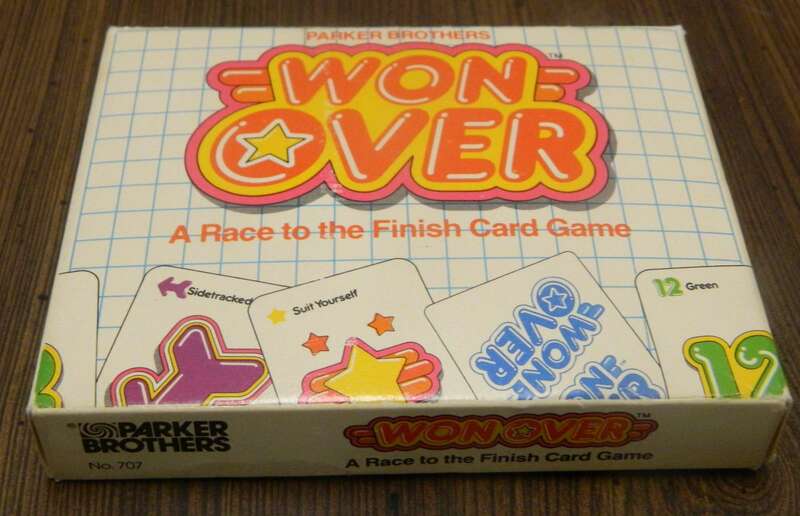 When all but one player has been eliminated from the game, the remaining player is the winner of the game. 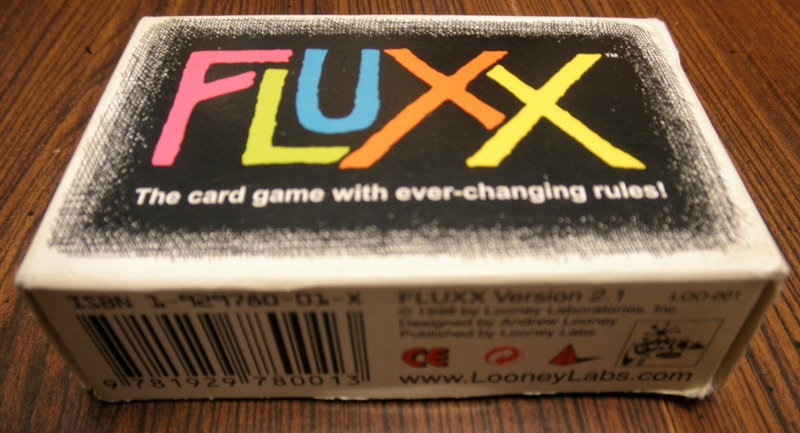 Beginning with games such as Flux, in recent years quite a few games have been made that rely on the concept of ever changing rules. As I said in my review of Flux, I like the concept of a game with ever changing rules since you never know what you can expect next. They generally rely pretty heavily on luck and don’t have a lot of strategy to them but due to their unpredictability they are still pretty fun games. Malta shares the ever changing gameplay of Flux but at the same time is quite a bit different. In Flux the object of the game is to collect sets of cards that meet the current winning condition. In Malta you need to keep track of the position of your playing piece in order to make sure that it stays in a position where it will continue being able to be moved. You also need to keep track of your cards to make sure you don’t run out of them. Malta is far from a perfect game but I had fun playing it. 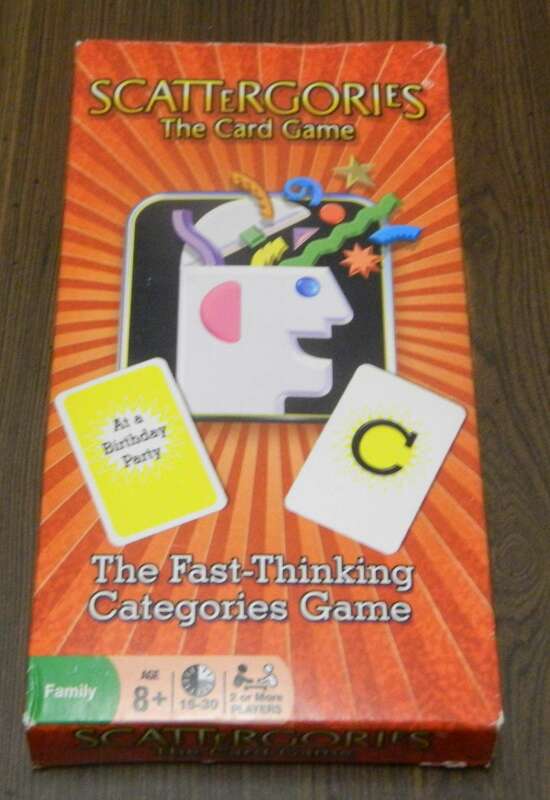 If you like these quirky card games where the game is always changing I think you will enjoy it as well. Malta is the type of game where your fortunes can quickly change. You can go from the top to the bottom and vice versa. One turn you could be thinking that you are in a good position and before your next turn you can be eliminated from the game. If you like this type of madness you should like Malta. While Malta thrives on it’s wackiness/anything can happen theme it can falter for the same reasons. 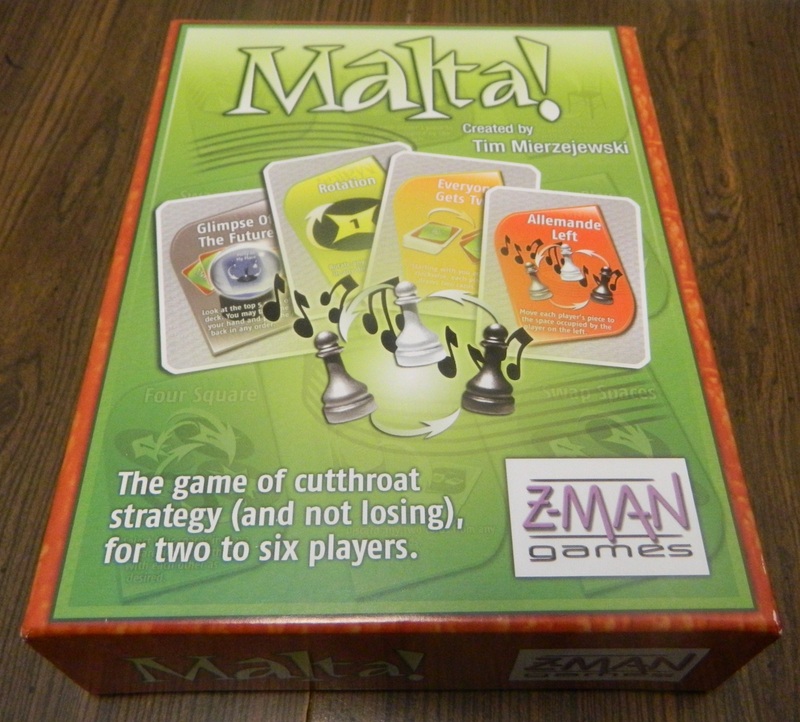 I see Malta as the type of game that will be exciting some games while being highly disappointing in other games. Some games with have wacky twists in fate that will be entertaining to watch. On the other hand a game could end with a player winning by default without having to do anything themselves to win the game (this actually happened in the game I played). This doesn’t make Malta a bad game but you should be aware that while some games will be quite good, others will be disappointing. Just like most card games there is a lot of luck in the game. No matter how good your strategy is, you can’t win if you don’t get the right cards. Outside of being able to figure out what cards to play and in which order, there is not much strategy to the game. The game changes so often that you might as well not come up with a strategy until it is your turn since it is very likely that your strategy would not work anymore when it does become your turn. In order to win the game you just need to luck into getting the right combination of cards that can be played in one turn that will eliminate another player. This reliance on luck leaves a feeling that you really don’t control your own standing in the game. How the game is set up I actually think you are better off attacking the other players than helping yourself. The way to win Malta is more about eliminating your opponents than surviving yourself. In the game I played one of the players kept trying to put their playing piece into a position where they were safe and could draw a lot of cards. This would be a great strategy except that it doesn’t appear to work in Malta. If you move your piece into a good position, by the time it becomes your turn again your piece would no longer be there. So for the most part turns spent on your own piece are a waste of time. Another problem with the game is that its’ length can vary greatly. The game I played was probably 20-30 minutes. The length of the game can easily range from a couple minutes to over half an hour. Someone could theoretically win on the very first turn. In general you are probably going to have a 20-30 minute game. At times it seems like the game could go on forever though especially if players keep playing cards that reverse other actions that recently occurred. For a quick paced card game where everything is changing constantly, the game tends to run slower than you would expect. This is due to turns taking quite a while to complete due to the need to keep reading the text on new cards. All this reading is due to players’ hands changing constantly. Almost every turn you are getting multiple new cards that you have to read through. Since you have to play half of your cards each turn, you then need to figure out which cards you want to play and in which order. Combine this with the fact that there are quite a few cards where hands are swapped, and there is more downtime where players try to figure out what all of their cards do. This wouldn’t be a big issue if it wasn’t for the fact that some players can be eliminated pretty quickly. You could be eliminated before even getting a turn and then have to sit and watch until the game ends which could be 20-30 minutes later. I ended up having to wait at least 15 minutes after being eliminated while the rest of the players finished up the game. Having to wait around could make getting eliminated early really frustrating. The cards in Malta are overall pretty good. The artwork is nothing special but it gets the job done. The cards are easy to read and for the most part the text on the cards are pretty easy to understand. The game comes with 108 cards so there are plenty of cards in the game. While quite a few cards do the same or very similar things, there is quite a bit of variety overall. Some of the cards are pretty unique and have a pretty significant impact on the game. I think the cards have some balancing issues though. Some cards are significantly stronger than other cards. Most of the cards have positive effects for the player who played it but there are some cards that are pretty harsh for the player who plays them. The cards that require getting rid of additional cards are particularly bad since they can easily end the game for a player. The worst card in the deck has to be “The Final Countdown”. With The Final Countdown the player is given two additional turns in a row after the current turn. That sounds good except that you need to set up all of the remaining players to be eliminated before your next turn (after the two extra turns) or the player who played the card is eliminated from the game. Near the end of the game this may come in handy since you could get all of the remaining players into a position where they will lose. If you are forced to play the card earlier in the game though you will almost be guaranteed to be eliminated from the game. Malta is the type of game that can create some bad blood between two players. A player can really mess up and rip off another player in the game. Either a player can specifically target one player or a group can gang up on a player. The targeted player really doesn’t have any recourse either since if other players have the right cards they can eliminate another player without any way to prevent it from happening. I know about the ganging up firsthand since it happened to me in the game I played. Two players in the game ended up ganging up on me without even noticing that they were doing it. It all began when one of the other players had a really bad hand. The hand included several cards that forced the player to get rid of cards. On the next turn the player who held the hands would end up losing since one of these discard cards would need to be played which would reduce the player’s hand to zero. The player then decided to play a card that allowed them to swap hands with another player which just so happened to be me. Before this I had a good hand and was in a good position to win the game. I now had a hand that would pretty much eliminate me on my next turn since I would have to play one of the cards that would get rid of multiple cards that I didn’t have. The only way I could avoid losing would have been to draw the perfect card from the deck. Well that went out the window during the next player’s turn since my playing piece was then moved to a space with no movement and didn’t allow me to draw anymore cards. I was therefore eliminated from the game. In a game like this you can expect things like this to happen and I don’t have a huge problem with it. At the same time it does feel a little cheap since there was absolutely nothing I could have done to prevent it. In a lot of games you can at least mitigate some of the damage when something like this happens. In Malta you just have to accept that at times you will be abruptly eliminated from the game without any way to stop it. Overall Malta is a decent game. At times it is fun while at other times it is frustrating. The length of the game varies significantly. Some games will be highly entertaining while others become boring. The game relies heavily on luck and for most of the game it seems like your opponents have more impact on your fate than you do. Due to the random nature of the game this is kind of to be expected. 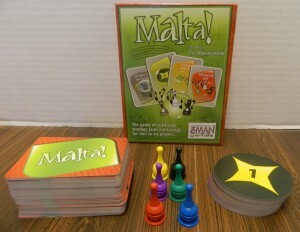 If you like the type of games like Flux where the game is always changing, I think you will like Malta. Otherwise I think you could get frustrated with the game pretty quickly and you will lose interest. 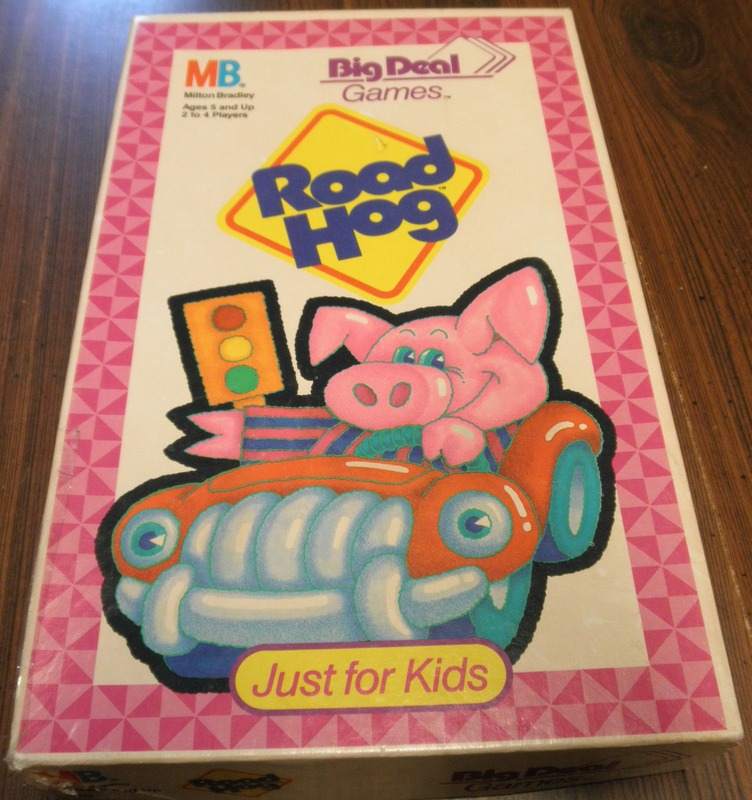 Has an interesting gameplay mechanic. The game keeps you on your toes due to the ever changing environment. It seems like you are better off trying to mess with the other players than tryin to help yourself. The game relies heavily on luck. The game can be frustrating for players eliminated early.